His family name is Assad, and his nephew is none other than Syrian President Bashar Assad. Yet neither fact stops Rifaat Assad from trying to cut as much distance as possible from the Syrian regime as he vows to crush the 40-year Assad family reign in Damascus. After more than a quarter-century of luxurious, self-imposed exile in Europe, Rifaat surfaced in Paris on Nov. 13 to launch a new opposition organization, the Syrian National Democratic Council  his first such move since the beginning of the nine-month uprising, which has so far killed more than 3,000 people. The group brings together disaffected members of Syria's Ba'ath Party, some of them regime figures under the former Syrian President Hafez Assad  Rifaat's older brother and Bashar's father  who died in 2000. 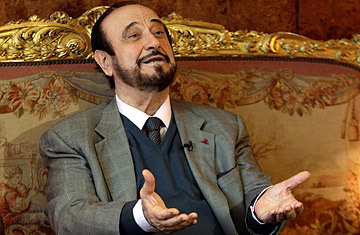 Rifaat says his organization would fight growing Islamism in Syria, including the Muslim Brotherhood and Salafi parties. Yet despite the group's high-profile launch, he had difficulty outlining the organization's platform during a 90-minute interview with TIME. In a long manifesto e-mailed to TIME afterward by his son Silwa, the older Assad says the organization would support Arab intervention in Syria, but not intervention from non-Arab countries. Now 74, Rifaat once led a section of Hafez 's military, before moving to Europe in 1984 after a power struggle within the family. Now, he says he commands wide support "in every village" across Syria, from people who he claims are clamoring for him to return and seize control from his nephew. "Minorities are the key in Syria," he says, explaining that he aims to bring together Syria's splintered ethnic groupings, including Christians and Assyrians, in order to restore peace. Despite recent defections within Syria's military, the older Assad says he is not interested in supporting dissident security forces as a means of toppling the regime. "Army defectors have contacted us, and most of them have asked Rifaat Assad to lead them," says Rifaat, who bizarrely referred to himself in the third person through much of the interview. "He has refused because the army defections will mean the beginning of a civil war." Despite launching his organization in Paris, Rifaat says he has not approached European leaders, who have scrambled in recent weeks to discuss Syria's mounting crisis with exiled opposition groups. "They should come to Rifaat Assad," he says. It is difficult to verify Rifaat's claims of support at home  or even the seriousness of his new group  in part because the Syrian government has banned most journalists from covering the uprising on the ground. Nonetheless, Syria watchers discount the possibility that the aging Rifaat could play a serious role back in Damascus. "He's still probably one of the more distrusted and hated people in Syria," Salman Shaikh, director of the Brookings Doha Center, who tracks Syrian opposition, told TIME on Wednesday. "He would not last two seconds in Syria." Nonetheless, Shaikh said Rifaat might well appeal to members of the ruling Alawite minority, whom his family has led for decades and who now fear being slaughtered if the regime collapses. Such support could be heavily outweighed by the opinion of most Syrians, however, according to Shaikh. "Rifaat has a history of being a very corrupt guy" who "looted the country," he says, referring to charges by the Damascus regime that Rifaat absconded with substantial funds from Syria's central bank on his exit. He denies the charges, which have never been brought to trial. Similarly, Jon Alterman, director of the Middle East program at the Center for Strategic and International Studies in Washington, D.C., says, "I can't think of a question to which Rifaat al-Assad is the answer." Indeed, it is hard to envision a greater contrast between the bloodshed on Syria's streets and the hushed calm inside Rifaat's sprawling mansion on avenue Foch, the most exclusive street in Paris. There, the aging military officer sits in his office, filled with gilded furniture, offering chocolate cookies and a selection of fine teas to his visitor. The tiny silk rose pinned in his jacket lapel signifies his French knighthood in 1986 by then President François Mitterrand, at a time when the two countries were closely intertwined in business and politics. Rifaat says his Paris mansion is now up for sale  one of several assets on his side of the dynasty on the market, according to Britain's Daily Telegraph, which last month said his family was cashing out its extensive European properties, including a vast spread on Spain's Costa Del Sol and Rifaat's $15 million house in London's Mayfair district, perhaps fearing that the properties could be frozen under fresh international sanctions on Syria. Leaving aside his family ties and his opulence, Rifaat has a more serious handicap in attempting a comeback. His alleged involvement in Syria's biggest-ever massacre, in Hama in 1982, when security forces crushed a nascent rebellion by the Muslim Brotherhood. In the 1989 book From Beirut to Jerusalem, Thomas Friedman cites Rifaat as telling his officers before the killings: "I don't want to see a single house not burning," and then, according to Friedman, boasting afterward to a Lebanese business associate, "We killed 38,000." Decades on, protesters are again being shot at in Hama, Syria's fourth largest city. And despite the passage of time, age does not seem to have mellowed Rifaat much. When TIME asks how he feels about the near-daily scenes on television of Syrian demonstrators being shot in the streets, he dismisses his nephew as being too weak to prevail. "Bashar is very different from his father," he says. "If his father was alive, there would have been 200,000 people dead today. Security forces are complaining that this man is not courageous, is not a leader," he says. "Bashar is meaningless now. He just says what is told to him." And for President Assad, that does not include any offer to resign. See how the Arab League is getting tough on Syria. See why Syria is unlikely to see a Libya-style intervention.